A newly discovered planet dubbed “mega-Earth” is shown in an artist’s conception. Kepler-10c orbits a sun-like star, has a diameter of about 29,000 kilometers (2.3 times larger than Earth), and weighs 17 times more. The solid planet may have a thin atmosphere that is unlikely to support life. 10c is located about 560 light years away and orbits its star every 45 days. The search for life in space — boosted half a century ago by a series of grade “C” sci-fi horror films — has been perking again lately, largely due to a gusher of newly found planets. The first exoplanet — planet beyond the solar system — was found in 1995 by two Swiss astronomers. That made headlines. These days, exoplanets barely make news. That changed on April 14, 2014, when scientists announced the discovery of the first earth-size planet in the habitable zone. Since January, roughly 950 planets have been found, largely by the Kepler Space Telescope, which was launched in 2009 to detect the slight dimming that occurs when a planet “transits” across the face of its star. These discoveries are helping fill in blanks in the Drake equation, an early effort to predict how many planets had invented powerful radios. A 2013 study, based on Kepler’s unwavering stare at 42,000 stars, found that 22 percent of sun-like stars in the Milky Way harbor Earth-like planets in the habitable zone. The habitable zone (green), where liquid water can exist, is farther from hot stars than cooler ones. 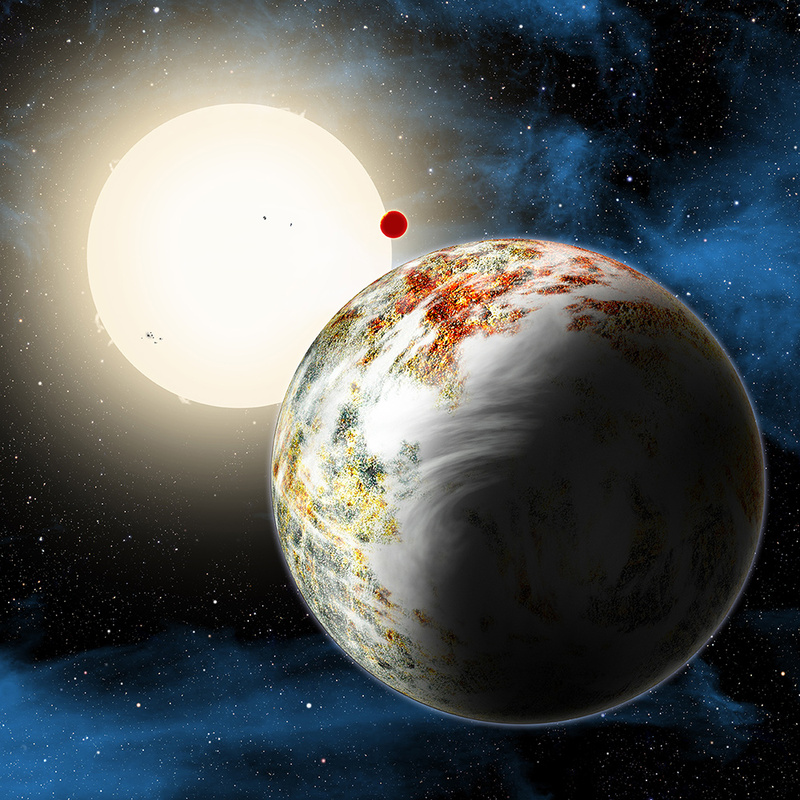 Rollover image to see an artist’s view of star Kepler-186, about 500 light-years from Earth in the constellation Cygnus. Kepler-186 is an M dwarf star with half the mass of the sun. Kepler-186 has five known planets, including Kepler-186f, which orbits in the habitable zone. A 2014 study concluded that 17 billion earth-like planets occur in the Milky Way alone — and our galaxy is one of roughly 100 billion others. Even the numero-numbskulls at The Why Files can calculate that: more than 100 billion billion earth-like planets could exist in the universe. Planets: Common yes, but alive? Granted, none of these discoveries prove that life exists beyond Earth, but they sure do jack up the odds. If planets are indeed so common, scientists are edging toward the conclusion that life is practically inevitable somewhere or other, especially given discoveries of life on Earth above the boiling point, in the sun-less, superheated deep sea, and in rocks buried a kilometer underground. “The likelihood that life exists out there, in my view, is almost certain,” Black says. Which is not to say that this life can be detected by today’s technology — or even tomorrow’s. Nor is it to say that these lost ecosystems are smarter than a bacteria-infested mudpot on the side of a sleeping volcano. 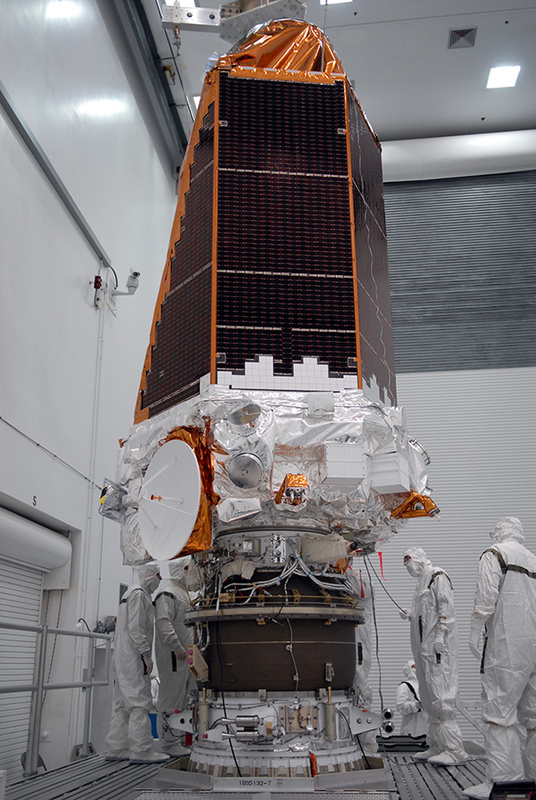 Kepler space telescope nears completion in a cleanroom at the Jet Propulsion Laboratory. Although Kepler is now hobbled by a severe guidance glitch, managers have figured out a two-year work-around to take advantage of its remaining capabilities. So how do we search? The many planets found by the Kepler spacecraft — suitably named for Johannes Kepler, who figured out the laws governing planetary orbits — could aid the design of the terrestrial planet finder, a plan for space telescope that could find and study Earth-like planets orbiting in the habitable zone. 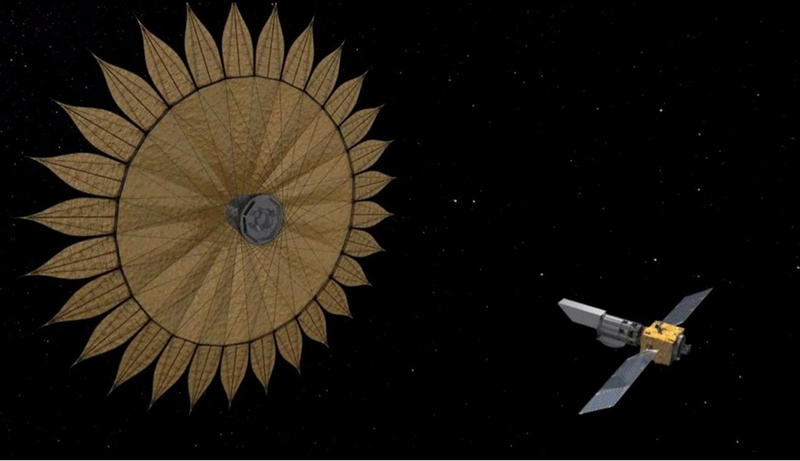 A sunflower-shaped “starshade” placed in front of a telescope could help a planet-finding telescope hunt for another Earth by blocking a blazing-bright star next to a faint planet. Estimates for various types of stars say they average between 0.1 to 0.5 planets apiece. If planets are rare, “a greater number of stars would need examination, and they are going to be further and dimmer,” says James Kasting, professor of geoscience at Penn State. That would force an already-expensive telescope to be even bigger. Kasting says the planet finder’s aim is to find one habitable-zone Earth analog with 95 percent probability. The spacecraft would also use spectroscopic analysis to identify which elements and compounds are present. The list of exoplanets is inflating like a Red Giant, to almost 1,800. In February, 2014, NASA announced 715 new exoplanets discovered by Kepler. What techniques are used to find planets beyond our solar system? 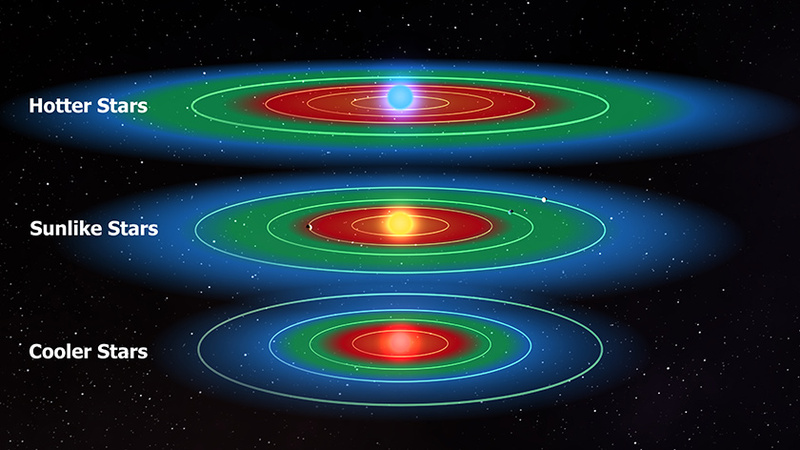 Planets can be found by different methods; Kepler space telescope has used the “transit” technique to produce a gusher of discoveries. Radial velocity Gravitational forces between a star and a planet affect the star’s position and alter its velocity relative to Earth. Earthbound telescopes can then detect changes in starlight due to the Doppler effect—the same phenomenon used by radar guns to nail scofflaw drivers. 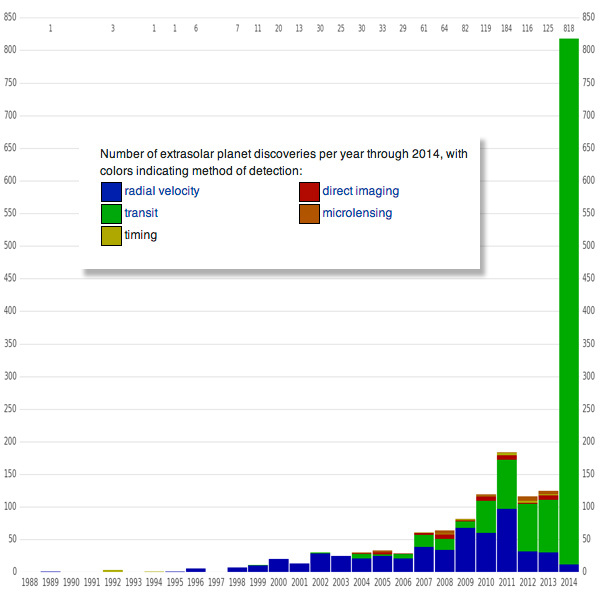 Radial velocity was the prevailing method for finding exoplanets until 2014. Transit A planet that “transits” (crosses in front of its star) dims the star. Transit only works if the star, planet and viewer are in line. Direct detection Because the visible light reflected from a planet is extremely faint next to the star’s light, astronomers use infrared imaging to detect a planet’s heat. This method is best for nearby planets that are distant from their star, bigger than Jupiter and very hot. Keck Observatory studies stars and planets beyond our solar system. 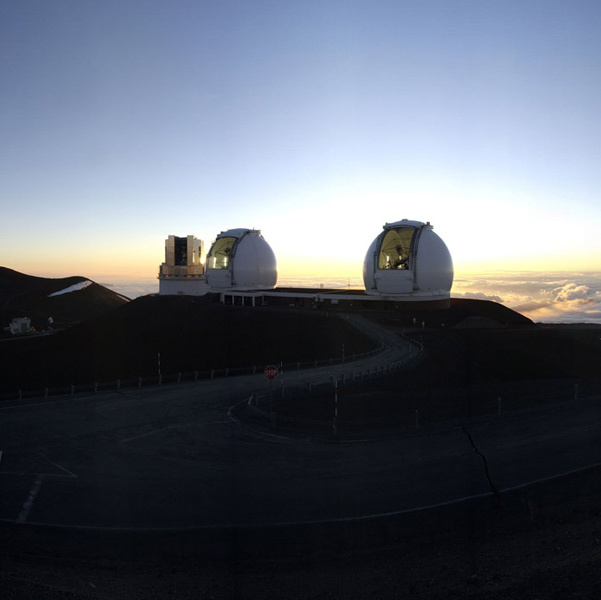 From a volcanic peak on Hawaii, Keck benefits from some of Earth’s darkest skies. The three designs under study must all cope with one blinding problem: seeing a planet right next door to a star that is vastly brighter (the sun, for example, is 10 billion times brighter than Earth). NASA, short of money, cancelled planet finder in 2011, but some astronomers hope it could be resuscitated at a planning meeting in 2020. Don’t expect a launch before 2030, Kasting warns. Livestock, including these pampered cows at the 2014 World Dairy Expo, produce about 19 percent of the annual production of methane, a potent greenhouse gas but also a telltale for a living planet. After a rocky planet in the habitable zone is discovered, what then? The closest stars are light-years away. Paying a visit would take decades, or more likely centuries. More feasible — though still difficult — is to search for evidence of life; a “biosignature,” in astrobio lingo. “When you look at Earth’s atmosphere, you see methane and oxygen that are totally out of chemical equilibrium,” says Black. Methane — the major compound in natural gas — is easily oxidized by oxygen atoms and radicals. The only reason our atmosphere contains 1.8 parts per million of methane is because “something is driving it, and that something is life,” Black says. Although some methane comes from geologic sources, more comes from organic sources, mainly bacteria in cows, rice paddies and other living locations. While studying iron and uranium isotopes in this jasper (a mixture of iron oxide and chert), Johnson’s team found that the iron had oxidized 3.4 billion years ago, in an ocean with little oxygen. Because mineralized remains of photosynthetic bacteria called stromatolites date to the same era, the team concluded that what the stromatolites were using “is more deeply rooted” type of photosynthesis that made no oxygen (modern photosynthesis, which does make oxygen). Therefore, even though the jasper is not made of organic carbon, its isotopes revealed an ocean with little oxygen and that, combined with the organic origin of stromatolites deposited at the time, reveals the existence of a different type of photosynthesis 3.4 billion years ago. So the jasper carries a biosignature for non-oxygen-producing photosynthetic bacteria on Earth at that early date. Other biosignatures are more subtle and may be impossible to analyze without feeding a sample into a heavy instrument, which entails the expensive and risky return of samples to Earth. The biosignature of a roadkill raccoon or even a million-year-old hominid femur is easy enough to identify. But on Mars, the supposed organic remains would have been bathed by solar radiation for three billion years, so “the likelihood of organic molecules remaining on the surface is very small,” Johnson says. 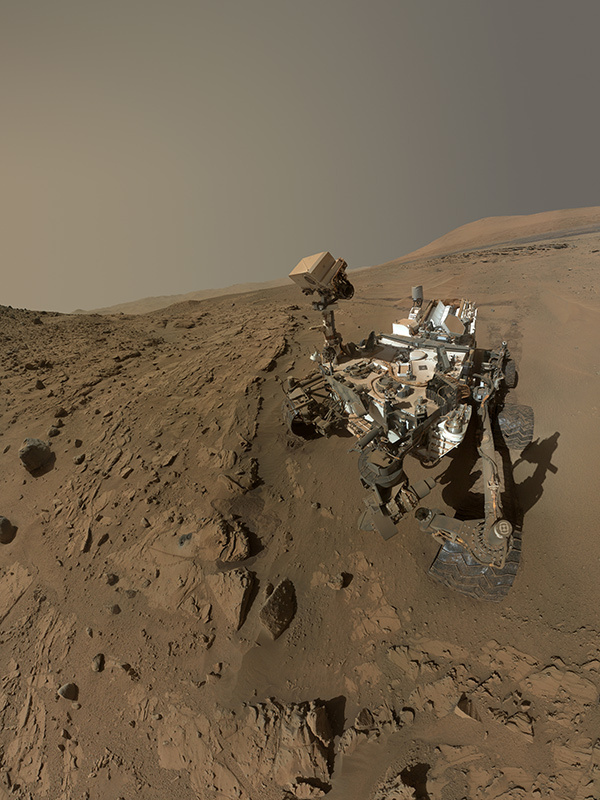 As the Mars rover Curiosity drilled into sandstone, its arm-mounted camera took 55 images that were fused into this self-portrait. Due to clever manipulations of the arm and the camera turret, the robotic arm is invisible in this mosaic. 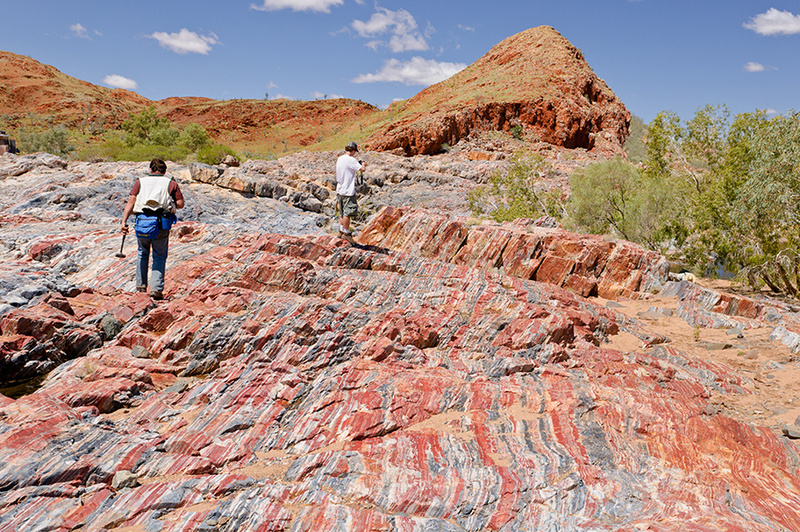 Organic material can, however, solidify into stone, and so Johnson’s research group studies 3.4 billion-year-old rocks in Australia and South Africa that have not been buried by tectonic movement or altered beyond recognition by metamorphism. Specifically, they look at isotopes in rocks that may have been formed from legions of microbes. Isotopes are atoms of a particular element with different masses that can be separated in a mass spectrometer. Isotopes allow one to recognize minerals with organic origin even after intense deformation. Johnson is especially interested in iron, which, scientists have recently deduced, played a major role in microbial metabolism more than three billion years ago. Enceladus: Tidal heating of Saturn’s sixth-largest moon may explain “cryovolcanoes” that spew out water, sodium chloride and other compounds. Starting in 2005, Spacecraft Cassini began to detect organic compounds and signs of an internal ocean. Titan: Saturn’s largest moon is the only moon in the solar system with an atmosphere. Rich in water, with a rocky surface, the moon has the only known lakes beyond Earth. Titan’s internal ocean was just reported to be “as salty as the Earth’s Dead Sea“, which does raise the odds for finding pickles! Europa: Shown in a colorized image, the smallest of Jupiter’s moons discovered by Galileo may conceal a deep, liquid ocean. Blue-white terrain is relatively pure water ice. 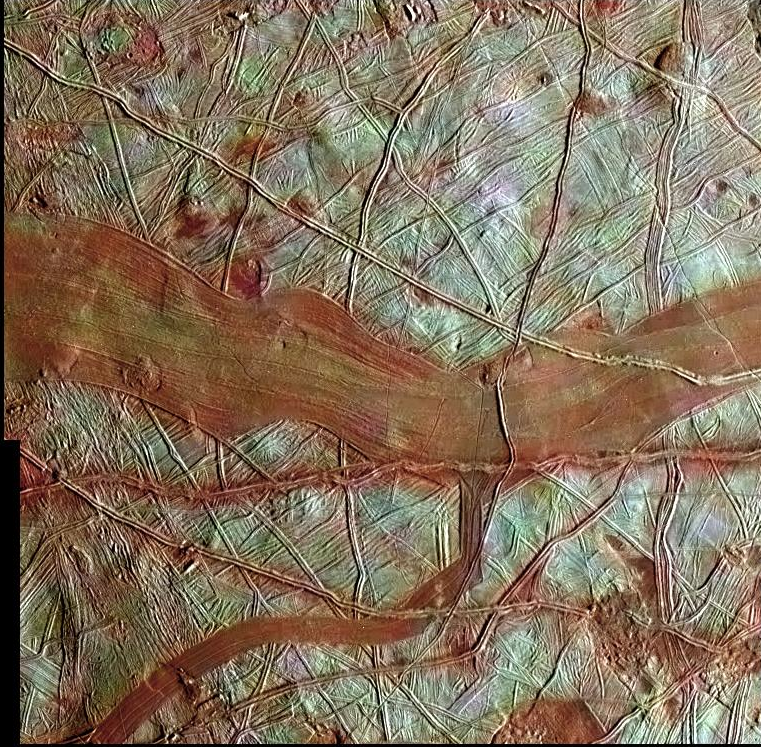 Reddish areas contain water ice mixed with hydrated salts; the ridges and disrupted features may signify some geologic connection with a sub-surface ocean. Any mixing could have raised evidence of life to the surface. Mars — Earth’s twin — has long excited and frustrated life-seekers. More than a century ago, astronomer Percival Lowell thought the “canals” on its surface were the work of long-gone Venetian gondoliers. Since then, NASA and others have mounted an intensive search for life on Mars. Although the planet is dry and cold now, surface features indicate the presence of liquid water a couple of billion years ago. At that time, therefore, Mars was a rocky planet in the habitable zone. Theoretically, life could persist deep underground — or some fossilized remains may still remain on the surface. But so far, it’s no dice. Despite some early enthusiasm, Mars seems lifeless, dead. Decades ago, before other telescopes grew acute enough to detect planets, radio telescopes that detect faint signals across the galaxy were the main hope for detecting intelligent life. Although the decades-long search for radio signals from space has had promising moments, confirmed discoveries of extra-terrestrial intelligence are easy to count: zero. What does Black make of the empty result? “The most disappointing message is that there is not anybody out there. Space messengers: Private or public?